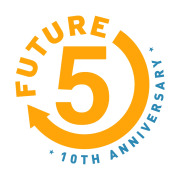 Future 5 helps motivated, low-income high school students in Stamford connect to their full potential. We believe it is never too late to help shape the life of a young person, no matter the economic or family circumstances. Our philosophy and community strengthens a student’s self-esteem through character building workshops, job preparation programs and one-on-one coaching. Future 5 students develop the motivation and a game plan for achievement in school and life. We are a membership organization, not a "program." We welcome people into a caring community, if they in turn are willing to commit to us (and to themselves), we in turn fully commit to them. Our coaching system embraces, not just the concept of one-to-one mentoring, but also the idea of a coaching support network. We have attracted 80+ volunteers annually representing many backgrounds, professions, and life experiences. Some of the membership experiences include: Game Plan Coaching, Community Service, Tutoring, College Prep and Job Prep. Our 3-year Membership Snapshot (2016-2018) 100% high school graduation rate, 97% "landed with a plan," 91% attended a 4-year or 2-year college, 89% are first generation fo attend college. Would you recommend FUTURE 5 INC?